Students will use rebar tie wire to make chains and pendant enclosures. 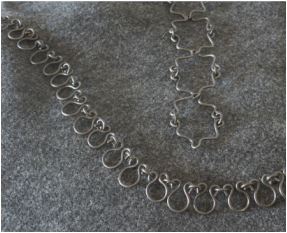 We'll cut, bend and forge wire to make sophisticated jewelry. Learn techniques to make modern jewelry with inexpensive, alternative materials and have fun in the process. Leslie has been a jeweler on and off for 45 years, and making jewelry non-stop for the last 10 years. She is particularly interested in unusual materials. Leslie is primarily self taught but indebted to some amazing teachers she's studied with. Pencil and notebook for ideas. 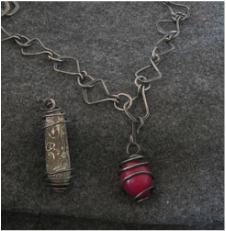 If you have a large bead, shell, found object etc that you would like to turn into a pendant, bring it. No promises but we’ll see if we can turn into a wearable. 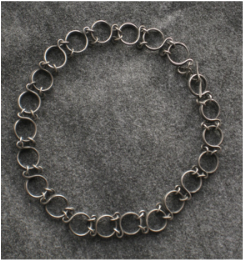 If you are thinking about a mixed metal chain, bring 16 ga wire of your choice. *Materials kit purchase is required for all our workshops. The kit insures all students have the same tools and materials require to learn the technique and allows the instructor and the students to focus on the technique rather than the materials. Maximum eight students. All participants will be required to sign a waiver. You may cancel up to 10 business days prior to the start of the class and receive a full refund, less $10 processing.